"Lena" redirects here. For other uses, see Lena (disambiguation). Alexander von Bunge & Baron Eduard Von Toll, The Expedition to the New Siberian Islands and the Yana country, equipped by the Imperial Academy of Sciences. 1887. Lena is a river of Siberia, rising at the height of 1640 m in the Baikal Mountains[? ], 20 km west side of Lake Baikal. The total length of the river is estimated at 4310 km (2860 m.), 3380 km (2100 m.) of which is navigable. 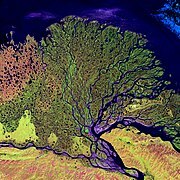 The area of the Lena river basin[?] is calculated at 2,500,000 km²; (805,000 sq. The Lena is one of the longest rivers in the world, and at 4,400 km, the longest river in the Russian Federation. The Lena river is an important waterway and navigable for almost all its length beginning with the village of Kachuga 4,125 km from its mouth. Spring drifting of the ice in the Upper Lena begins in late April and by the end of the first ten days of June the Lena river waters are flowing to the Laptev Sea.